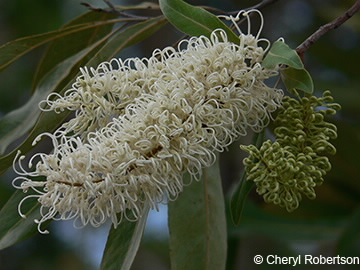 This north Queensland native is often grown as a street tree. The juvenile leaves are deeply divided but adult leaves are undivided. The white flowers, that have a hooked style when in bud, are borne in a long spike. The fruit is a small dark brown follicle containing flat winged seeds. Flowers in summer. Planted in various areas but common near the A2 carpark in Cairns.